Blog posts : "Other Shows"
Check it out! I was interviewed by 16Hertz, a New York-based web site that specializes in LED and arduino-based projects for the entry level Maker. Introducing our newest walk-around strolling party character: the Venetian Color Thief. She is a beautifully detailed Venetian costumed character who steals the colors from people around her and displays them in a dazzling light show. I just got back in town from the first annual NC Merfest in Cary, North Carolina. How do I describe this experience in words? I can do my best to describe the magic, share the art, and reminisce about the sheer, unadulterated joy, but somehow words just aren't enough. We've got new costumes! 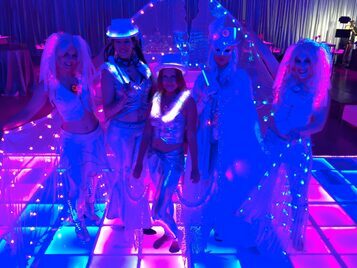 Our glow fur costumes are amazing. They're super bright, incredibly eye-catching and programmable! That means we can change the colors to match any even theme. This week was supercharged with fire and water, with three mermaid shows and three fire shows. 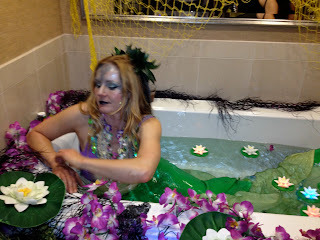 This past weekend I got to play the Mermaid Oracle at the Pagan Alliance's "Vampirates" party at Pantheacon in San Jose.